Following on from the planning and site-set up we covered in part 1 – we now get into the lighting and shooting workflow for the first two locations on the shoot, spread over two days, with two models. 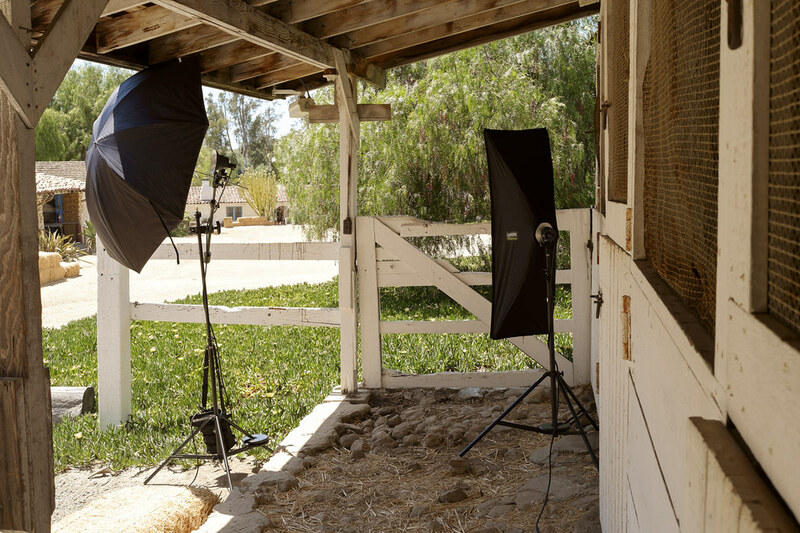 This is a two head Elinchrom Quadra set-up, and the first round of shots uses a 60″ brolly as the key light, and a basic head with small reflector as a hair/rim light, positioned behind the subject. You can just see the hair light, peeping out to the right of the vertical post. 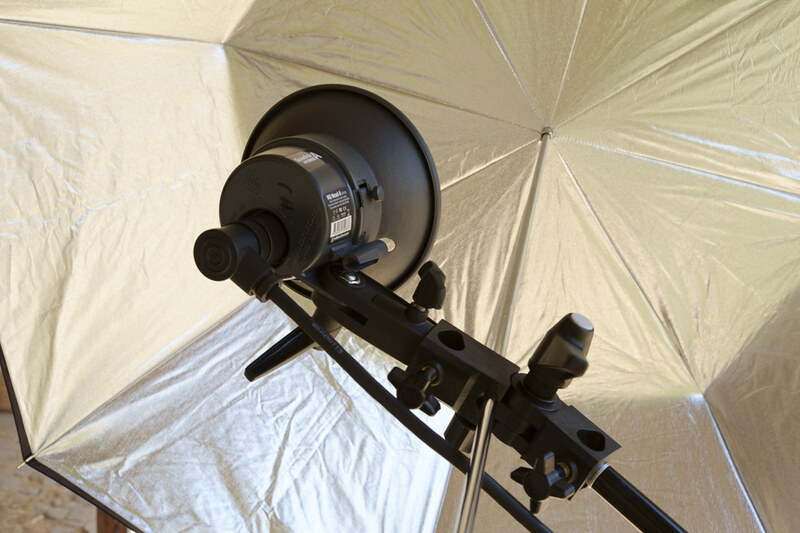 The 60″ brolly will provide a large light source, so will soften the illumination when used close-in to the model. The light stand will need extensive weights to keep it from blowing over – the 60″ brolly makes a great sail! Don’t underestimate show important this is when shooting on location – or it’ll cost you. The rear hair light will help to isolate the model from the background, and give the impression of sunlight streaming through her (blonde) hair. You’ll find that you can’t use wide-open f-stops, as the camera’s base ISO of 200, and the ambient light level, will exceed the shutter speed at 1/180. You should then fit an ND filter, I used a 4-stop ND in this case, to reduce the light, and allow you to shot at wider apertures for more attractive DOF effects and bokeh. Then use the Sekonic meter in flash mode to measure the output from the key light at the same spot as the model will stand. You need to dial-in +4 stops of ND filter into the meter to account for the filter on camera. Adjust the power of the flash until it matches the f/stop of the ambient exposure you took with the X-T1. You now have balanced flash to daylight, and you can go up or down from here to make the background lighter or darker, adjusting the flash output level, and camera f stop accordingly. When the model arrives, shoot a couple of test frames and inspect closely using the EVF and/or LCD to ensure you are happy with the flash and background exposures – adjust to taste. With the model facing the key light – you get a nice soft primary illumination on the face and body – tailing off as you move to the right. The rim light can be brought into play, and in this case has been kept just out of frame to the right, providing an attractive ‘sunlight’ flare and hair light effect. WB should be set to flash in this case, as it’s the primary light source – although you can experiment switching between flash and daylight to see which you prefer in post processing of RAW files. Flash adds a little more ‘warmth’ to the WB by adding in more magenta tint – you may prefer one over the other for any given shot, depending on subject etc. The single large brolly provides a nice single catchlight in the eyes – and this really helps to add life to the model’s expression. Shots without a catchlight tend to look ‘dead’ as the eyes are black, without that spark of life. Even a small on-camera flash can help basic portraits by providing a catch light – and I’ve even worn a white shirt when shooting daylight portraits, to generate a catchlight in that way. Simple, but it works! You can see how the hair light rings the model’s head, and really provides excellent separation of the model from the background. 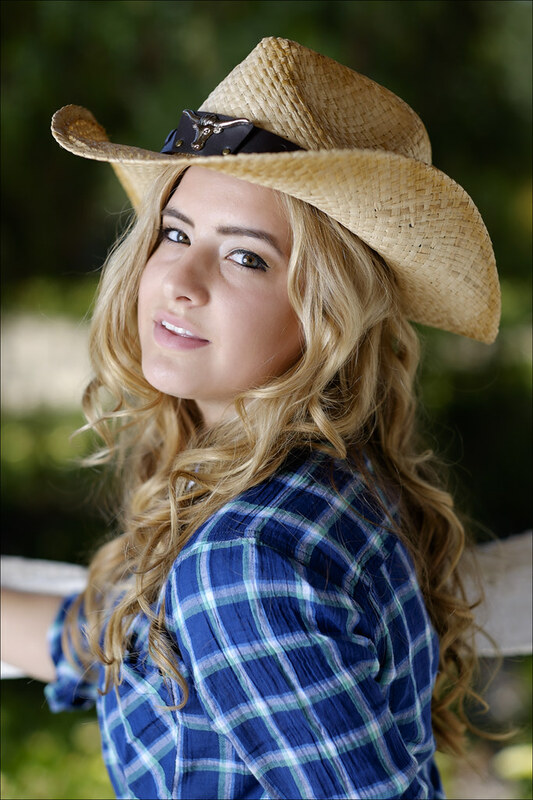 It’s particularly effective with lighter colored hair, and adds to a ‘summer’ ‘sunlight’ feel to your images. A good tip is to pause every 10-12 shots, select a good shot on the rear LCD, and show the model how she’s looking. This helps to build confidence, and helps him/her to understand what you’re seeing, and how the final images will look. I don’t recommend doing this after every shot, as it breaks the workflow – but every 10-12 frames is good, and gives the model break at the same time. Moving to day two of the shot, at the same location, we have a different model, and require a different set-up for the lighting. We have a darker skinned model with black hair, so need to adjust our lighting set-up accordingly. Separation from the background is no longer an issue, as the black hair really stands out from the greenery – so we move the rear light back to the front of the model to provide a secondary source of frontal illumination. We keep the 60″ brolly as key light left, and add the second light as a Lastolite hotrod strip soft-box (right). This illuminates the model from head to toe, with lovely diffused light, and provides essential fill to that side of her face and body. Without the fill, her darker skin would reflect so little light on that side, that it would appear too dark in contrast to the side lit by the key brolly. Using the Elinchrom Quadra, we automatically get a 2:1 lighting ration between main and fill heads, and this can then be modified by changing the light modifier used, and varying the flash distance from the model. In this case, the choice of brolly and soft box evens out the illumination, giving a nice soft over-all ilumination. The more specular illumination provided by the silver brolly, helps to create highlights on her skin, better defining her 3D shape, for example, on her legs. THis is a key requirement for darker skinned subjects. Darker skin benefits from specular highlights, lighter skin from more diffuse over-all lighting. In this set-up, we have two light sources on the model, creating two catch lights in the eyes. Not much we can do about this – but pursuits dislike the two catch-light look, and some folks even edit one out in post. The Quadra head takes Elinchrom standard brollies, with 7mm shafts. Most US brollies have 8mm shafts, so won’t fit! The fixture is only plastic any way, so hanging a larger brolly off of it would probably be a bad idea in any wind. You can however buy a standard brolly mount that will fit onto your light stand – taking the Quadra head on top, and any brolly securely through the tilting head. This opens up the system to sue any make of brolly, and any size – and the adapter is typically around $20-$30. Moving further under the awning of the barn, we disable the flash system, and remove the ND filter, so that we can take advantage of the wonderful reflected light for some close-in portraits with shallow DOF. The new Fuji 56mm lens is excellent, in that it allows you to open up to f/1.2 if required, and obtain wonderful bokeh and a very appealing final image quality. The challenges at wide apertures are depth of field and focus – DOF is razor thin, and you need to put the focus box on the exact point of focus, and resist the urge to focus and recompose. This is the only way to get your hit rate up for extreme shallow DOF shots at close range – you can choose to try other methods, but you may be disappointed by a lower hit rate – and many folks end up blaming their new lens, rather than refining their technique. Shooting with strong backlight, you’re almost certainly going to have to make exposure compensation with the EC dial in order to get the exposure you want for the face. This is easy enough to judge using the EVF and LCD, which provide a reliable representation of exposure, so within a few shots you can fine tune your EC, and be shooting away. In this case I used +1.33 EV – giving a lovely high key backdrop to the model’s face, and an over-all soft quality to the light in the image. I’m shooting at f/2 to get all of the face in focus, but a nicely soft image outside of that. Changing up to f/1.6, we get even less DOF, for a dreamy look to the image – I’ve also gone for a higher viewpoint, which natural presents a more ‘submissive’ feeling to the image – purely based on the POV. Using the same methodology as day one, I’m under the awning of the barn, shooting with available light – this time at f/1.4 with +1 EV exposure compensation dialed in. The end results are always a hit with the model – as they rarely get the soft and dreamy look from studio shoots, where flash has the photographer shooting at a very crisp f/8-f/16 all the time. This style of photography is perfect for portraiture, weddings, engagements, even seniors photos – and it’s worth just stepping back from the flash set-up to shoot a few natural light shots, where ever you are. We’ll move on to an advanced location flash set-up in part 3.